I pick up vanilla in the nose, a very good sign from the start, with a hint of nutmeg. 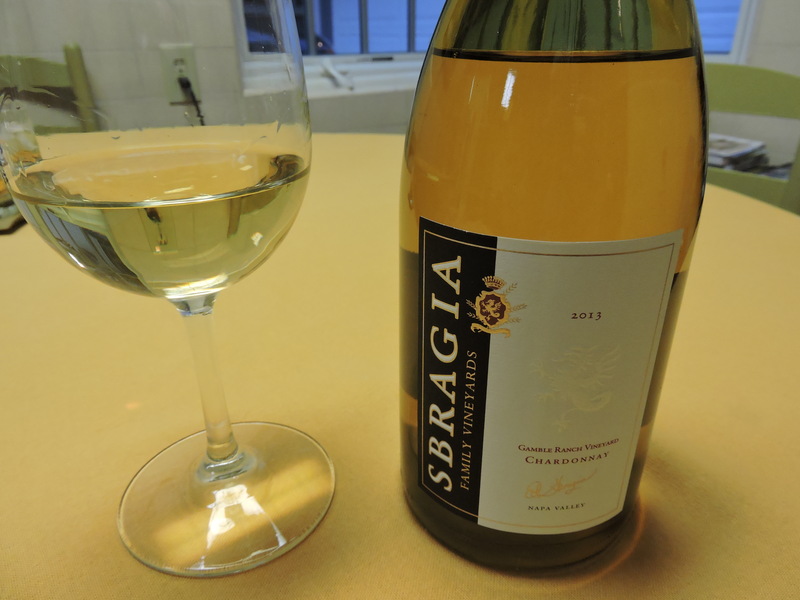 This wine is full of creamy richness with pear overtones. You can see the creaminess in the body of the wine by its thick legs on the sides of the glass. The color is medium golden. It is flavorful and complex and finishes with a smoky aftertaste of roasted marshmallows. 14.8% alcohol. 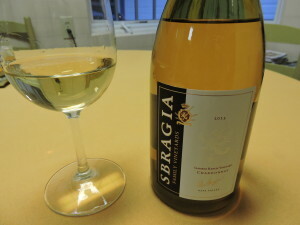 I asked my friends to taste this wine with me and here are their comments: “luscious and creamy”, “elegantly styled, polished body”, “smoky finish, hints of nutmeg and clove in the nose.” Even the non-white wine drinker in the group found plenty of good things to say about this Sbragia Chardonnay. Overall, I loved this wine. But, I have to warn you, the wine sells for $48.00 at the winery and approximately $40.00 online. 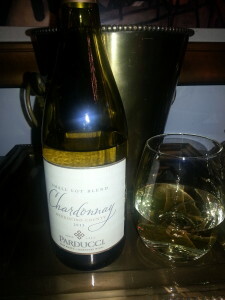 When I started this blog, I set out to find reasonably priced, but delicious, creamy or buttery, oaky chardonnays. So, with that said, I would recommend this wine for a special occasion. I’m still on my mission to find something as delicious but at a lower price! This is a small lot blend designed, according to the winemaker’s notes, to be a blend of bold, lively flavors. In style it is polished and refined, tastes clean, light bodied and light on the palate with a little bit of acidity. It is delicate and faintly flavored with hints of creamy vanilla and caramel but nothing distinctive. It is even light in color. It drinks well but doesn’t live up to its promise to be a bold and lively wine. This tasted well in the winery, so I’m not sure why this subsequent tasting doesn’t measure up to my first experience. But, we are headed back to Parducci in March to pick up our wine club shipment. I’ll give this chardonnay another try then and report back. The wine is 13.5% in alcohol and retails for $9.90 at Safeway or $13.00 at the winery.